From the outset, action heroes were almost always portrayed as stoic supermen. From the sneering “Dirty” Harry Callahan to the dead pan Paul Kersey, protagonists in action films rarely showed anything resembling vulnerability. Even the ones who used fists instead of guns (such as Bruce Lee) possessed some sort of otherworldly ability that made them more than ordinary men. By the time the 1980’s rolled around they were even outfitted with comic book physiques that made the ultra-masculine ideals they represented seem that much more unattainable. It was in the latter part of the decade that a high concept offering from producer Joel Silver would set a precedent in the genre by going against that trend. It cast a TV star who was physically unremarkable and without a hint of stoicism in the lead role plunked him in the middle of a warzone. New York City Police Detective John McClane (Bruce Willis) flies out to Los Angeles on Christmas Eve to reunite with his estranged wife Holly Gennaro (Bonnie Bedelia). He meets up with her in the Nakatomi Plaza skyscraper, where her employers are throwing a massive Christmas party. Not too long after McClane arrives, the building is besieged by a small but highly organized group of terrorists lead by the dapper and calculating Hans Gruber (Alan Rickman). They take the 30 or so partygoers hostage and lock the building down tightly. McClane evades capture but remains confined to the building. Left with scarcely little in the way of options, McClane must figure out a way to not only survive, but to save his wife and aid the authorities in taking out the terrorists. So goes the plot of the first Die Hard. Die Hard took a novel concept and managed to up the novelty factor with a stroke of inspired casting. The film was based on Roderick Thorp’s thrilling 1979 novel Nothing Lasts Forever. The book told the story of Joe Leland, a retired police officer and WWII vet who travels to L.A. to see his estranged daughter. The film took the basic premise, eschewing the daughter for the wife and changing the hero’s surname to McClane. Otherwise, Die Hard remained fiercely loyal to its source material, using dialogue, situations, and characterizations right out of the novel. Clint Eastwood and Richard Gere were originally considered for the role of McClane. Instead, it was handed off to Bruce Willis, who at the time was known primarily for known for the hit TV series Moonlighting. To say he was an unlikely choice was an understatement. His only two cinematic outings up until that point had been a pair of forgettable Blake Edwards comedies that came and went unceremoniously. He had a blue collar brand of northeastern charisma, characterized by a disarming smirk. He also had an average physique and a dissipating hairline. Next to Schwarzenegger and Stallone, he seemed like nothing more than a bar patron, hardly the kind of man who could take on a terrorist cell and win. Yet, such attributes made him much more effective in the role than his chiseled brethren. 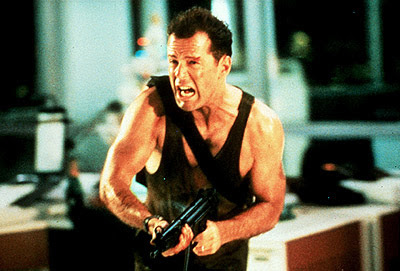 McClane wasn’t physically superior to his adversaries. He didn’t know martial arts, and his training was limited to whatever he learned in the police academy. Though he was hardly a coward, he spent most of his time running and hiding from his enemy rather than facing them head on. As his situation grew bleaker, his confidence waned and his vocabulary grew more profane. His marriage was in trouble due to his old fashioned values, and he had a bigproblem with authority. 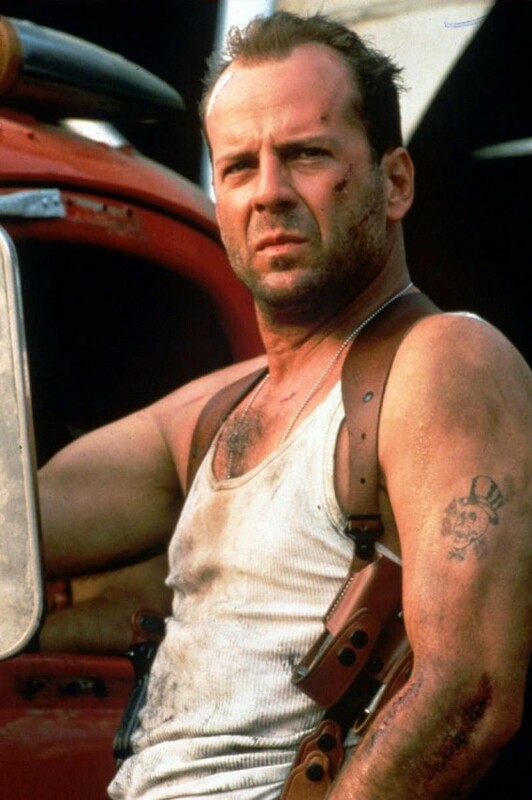 As played by Bruce Willis, John McClane was the most recognizably human action hero yet. He was the audience for the film, thus making him easy to root for. Die Hard was a sizeable, though not runaway, success. Its influence proved further much reaching than its box office take indicated. It not only started a franchise, but steered the entire action genre away from using superhuman protagonists. Working class heroes became the order of the day. The same went for high concept plots in which the action was corralled into a confined structure or space. None of that would have happened had Die Hard not been as taut and suspenseful a film as it was. Its hero won over the crowd simply by surviving his ordeal, and wound up changing action cinema in the process. It doesn’t get any more American than that.